Venus Pearl is a light-cured, universal, radiopaque, nano-hybrid composite based on the urethane monomer chemistry of Venus Diamond. According to the manufacturer, Venus Pearl provides the same combination of low shrinkage stress and increased durability as Venus Diamond with a creamier consistency for fine detailed work with excellent sculptability and polishability. 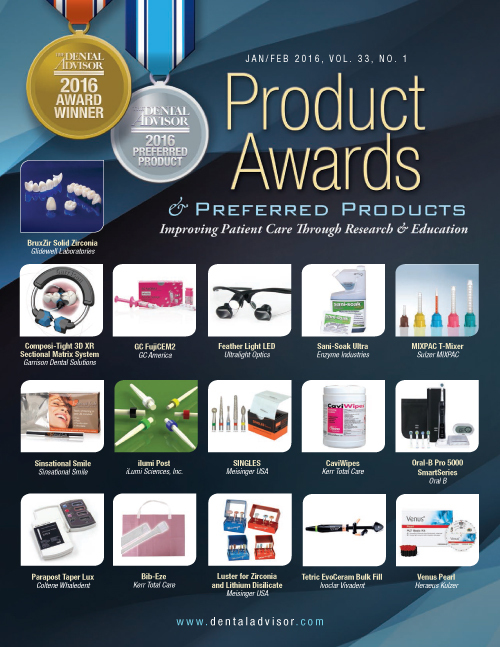 Venus Pearl is suitable for all classes of anterior and posterior restorations. Venus Pearl is designed to produce a durable, highly esthetic result with a long-lasting high luster polish. Venus Pearl is available in both syringe and unit dose (PLT) delivery in 27 shades including two new shades: GUM, a pink translucent shade for gingival recession areas, and CORE, a green core build up material for easy identification with a 3 mm depth of cure. Venus Pearl should be light cured 20-40 seconds per 2 mm increment. The basic kits contain either 30 PLT’s or six syringes of composite, a 2 mL bottle of iBond Total Etch and accessories. The master’s kit contains all 27 shades. Venus Pearl was evaluated by 28 consultants in 833 uses. This universal composite received a 91% clinical rating. Venus Pearl is a very good universal composite that may be used in single shades or layered when desired. The consistency is softer than Venus Diamond, which was viewed as a good expansion to the Venus line of composites for dentists who like a lower viscosity, especially for anterior restorations. Handling was rated very good. Shades provided in the basic kit are somewhat opaque; however, the full range of shades available offers three levels of translucency including incisal shades. Finishing is easily accomplished with an excellent quality of the final polish. 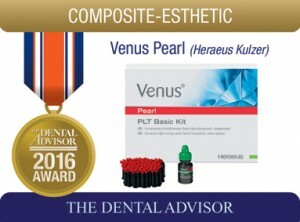 Thirty-two percent of consultants rated Venus Pearl better than other universal composites they had used and 43% rated it to be equivalent. Forty-six percent would switch to it and 79% would recommend it to a colleague. Venus Pearl handles well with a brush to manipulate the surface of the material.